Every once in awhile, I'm fortunate enough to be involved in projects that truly "make a difference." This, for me, is one of those projects. 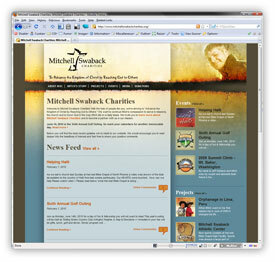 Mitchell Swaback Charities, formerly known as The Mitchell Swaback Foundation, launched their new web site at www.mitchellswabackcharities.org. Mitchell Swaback Charities was started in 2004 by family and friends of Mitchell Swaback after he suffered from a fatal accident on August 14, 2004. They wanted to continue Mitch's "compassion to serve in missions, the church and to honor God in the way Mitch did on a daily basis." For over five years now, they have been busy fulfilling their mission through a variety of projects and events that continue to impact people throughout the world. The site is powered by Adobe® ColdFusion® and Microsoft® SQL Server with online content management provided via Mura CMS. I was able to fully integrate Jaci M.'s completely custom "bloggishy" design into Mura CMS without a hitch. I leveraged a number of class extensions and custom display objects in Mura CMS to pull everything together. I was even able to pull in my cfMediaPlayer project from RIAForge to allow the client to upload and display video quickly and easily. Luckily, Amazon added streaming capabilities to CloudFront just in time for me to allow our client to stream their video as well. Along with a typical "donate online" feature, the client had a few unique needs such as the ability to "flag" nearly any project as "supportable" which would then allow a visitor to direct their donation amount(s) towards that particular project. Other custom e-commerce applications included a "charity event participant sponsorship" application and a complete "golf outing sponsorship and registration" application. I truly felt privileged to be a part of this project and hope that my work further enables MSC to continue thriving and growing in their mission to "Advance the Kingdom of Christ by Reaching Out to Others." Congratulations and thank you to everyone at Mitchell Swaback Charities. Rockford Linear Motion, a subsidiary of Rockford Ball Screw, has just launched their first ever online presence at www.rockfordlinearmotion.com. The site is powered by Adobe® ColdFusion® and Microsoft® SQL Server with content being managed by Mura CMS, a comprehensive web-based content management system. 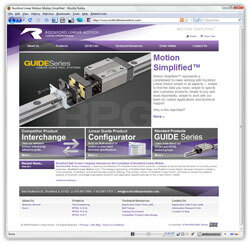 Rockford Linear Motion offers a fully customizable lineup of linear guide rail systems, products and services. This was my first "commercial" web site constructed to be managed by Mura CMS. I was able to take our designer's (Greg L.) completely customized design from Adobe® Illustrator® + Photoshop® to CSS + XHTML and then fully integrate this design with Mura. I was also able to leverage and extend much of Mura's functionality to achieve the final result. At the client's request, we also integrated the custom design with two other third-party vendors including Catalog Data Solutions and Network Solutions CommerceSpace™. Needless to say, I learned quite a bit about working with each of these vendors and look forward to working with them again. Amazingly, we were able to launch the site within three (3) weeks of receiving the final design files for the site. 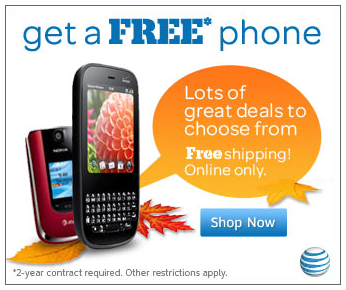 As anyone who builds web sites would testify, this short of a timeframe is definitely not the norm. However, by utilizing Mura CMS and ColdFusion, we were able to get the job done in record time. Congratulations to the folks at Rockford Linear Motion! Also, a huge thanks to each person who assisted me in keeping this project moving at light speed.